Graham O’Reilly has directed the Ensemble Vocal de Pontoise since its foundation, at the initiative of the town of Pontoise, in 1999. It consists of around 30 good amateur singers, and concentrates largely on repertoire written before 1750. It has explored Baroque music from throughout Europe, and sings in Spanish, Portuguese, Italian, German, English and French as well as very often in Latin: sacred music forms a large part of its repertoire. Much of its repertoire is for double choir, and includes composers such as Bach, Schütz, Carissimi, Victoria, Padilla and Esteves. It makes also brief visits to the twentieth century, and has recently sung music by Poulenc, Duruflé, Britten, Langlais, Leighton and Mealor. 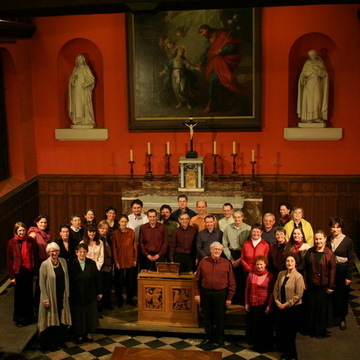 The Ensemble Vocal de Pontoise prepares three programmes per year, corresponding to the seasons: sacred music for Christmas and Easter, and often secular music in the summer. As well as Pontoise, it has been heard in towns round about (Cergy, Théméricourt, Méry-sur-Oise, Montreuil-sur-Epte, Frouville, Le Perchay, Ermont, Enghien-les-Bains, Guernes) as well as in Paris. Graham O’Reilly regularly involves the members of the Ensemble William Byrd in the activities of the Ensemble Vocal de Pontoise, and will do so again in the Ensemble’s production of Purcell’s Dido and Aeneas, which will be heard in Pontoise and Paris in April 2014.